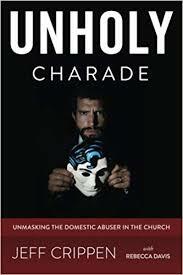 I have known a genuine Christian who is a domestic abuse survivor for over six years now. She contacted me after finding my domestic abuse sermon series online. She was in a legalistic, cruel counterfeit church at the time, and when she separated from her abuser after many, many years of misery, her “church” ex-communicated her. That is a real story in itself. In addition, she has endured much suffering due to physical ailments from the abuse and is now disabled, unable to work. She maintains a joyful spirit through it all and I have no doubts about the reality of her Christian faith. There is a real need right now. In spite of having a very basic income (which isn’t adequate) the federal and state governments still tax the support money she obatined in the divorce settlement and she owes $1540, due of course by April 15th. I will keep you updated and let everyone know when the need is met. Thank you, Pastor Crippen, for reaching out to help this woman. Her situation sounds similar to mine. My divorce was final last year, and I too am facing a huge payment to the IRS as a result of the minimal spousal support I received from my ex after over 3 decades of marriage and other financial issues caused by the divorce. Interestingly, spousal support from divorces that are final after 12-31-18 are no longer subject to federal income tax. That law was changed too late for some of us. I cannot financially help that woman, but I will be praying for the funds she needs to be supplied by our faithful and amazing God. Yes, that 12-31-18 date is the same thing this lady is up against. Her divorce was before that time. On top of that she lives in a state that really slaps people hard for taxes and moving away just isn’t possible for her. Anyway, when these situations and needs arise it is going to be pretty exciting how we can be a part in helping. I will be sure to report to everyone how it goes. Thank you for this opportunity! I have been praying for some way to help and do something for someone else. As always, God’s timing is perfect. Horrifying situation… I am so sorry. God Bless you, Pastor Crippen, and this dear woman. Em- it really is a good opportunity for all of us. We all can’t give financially but we can pray and see how the Lord provides. Nowadays it isn’t easy to know how or who to help. In this case I assure everyone this is a valid case of a widow indeed (widow by abuse). Thank you! I will be grateful for the opportunity to help her. Is there anything that the government does not tax?! Even the little bit of interest made on any savings gets taxed as well. This just breaks my heart. This sister in the Lord even gets taxed on some spousal support SHE DESPERATELY NEEDS. Greedy government. I was just thinking yesterday how I would like to send some money in so that if someone needs a book it would help cover the cost. I will be happy and able to donate Pastor Crippen. I wrote the state where I live the other day. Maybe this lady lives in my state and she could stay with me? When I read the post concerning this sister and the dilemma she is in this is the scripture that came to mind. EVEN SO FAITH, IF IT HAS NO WORKS, IS DEAD, BEING BY ITSELF. BUT SOMEONE MAY WELL SAY, “YOU HAVE FAITH AND I HAVE WORKS; SHOW ME YOUR FAITH WITHOUT THE WORKS, AND I WILL SHOW YOU MY FAITH BY MY WORKS.” JAMES 2:14-18. I am in my mid 50’s, female, my daughter and only two grandchildren live five minutes from me. The Lord has blessed me in a overabundance that I am happy to share with a true believer. I trust Pastor Crippen’s discernment that this lady in need is a true believer. I wanted you all to know that is why I mentioned if she needed a safe place to stay and just so happened to live in my state. Everything I own belongs to the Lord and it is the right thing to do to share with others going through a difficult time. If Pastor Crippen and Verla are ever in the Dayton, Ohio area I would be honored to have them as house guests and Christian fellowship. I will be more than happy to help this dear lady any way that I can. We all are merely stewards of whatever talents, resources, etc. we have available to us. Everything on this planet (and beyond) is God’s. And if any of us are especially blessed in this life, be it money, earning power, opportunities, it should be remembered that it came from God. I don’t have much of anything, probably way less than the person in need, but I figure if all the subscribers stuck a few dollars in the mail, the tax bill would be paid in no time. Sometimes I wonder if people don’t give because all they have is a dollar or two, but the email list is something like 800 people strong, so let’s all stick a dollar or two in the mail. If anyone can do more, by all means, go for it, but if anyone else can spare a dollar or two but didn’t want to mail such a low amount (but if it’s all you have, it’s actually a high amount) then join me, as that’s what I am going to do. And it’s bad form to say what a person is going to do, but I’m mentioning what I am doing, in hopes of others following suit. Most survivors have little to no money, so a dollar or two in an envelope is a big deal, no need to feel bashful that it’s not something more, or to worry that it’s potentially insulting. 800 subscribers at $2.00 each means that tax bill is paid and there’s left over funds to spare. Its a pretty powerful thing that a group like ours can do! Thank you. We have $500 in hand and more I know is coming in snail mail (which is fine). I will give updates. Oh, good! Since you hadn’t posted any $ amounts, I worried that nobody had given anything. Good. We should take care of our own. It’s hard enough to ask for help in the first place. “For the tax bill. . . from my tax refund. 😁” via PayPal – here is my gift.